I’ve been building websites and blogging for over 14 years and I only started to see the value in building up a mailing list a couple years ago. The reason why is because I always figured email was a dying technology. We read articles about it all the time, but it’s the only communication medium that I’m guaranteed to check on a daily basis. Twitter and Facebook are great, but I can easily bypass the messages on them. Hell, Facebook doesn’t even show me all the posts from the people I follow. However, with email, it is guaranteed to come across my desk and that means at the very least I’ll read the subject line. Your mailing list is your direct line to your tribe. Makers Cabin is almost solely run through its mailing list. I only started to blog on there (development posts take a looooooong time to write) so I had to generate traffic and sales through activity on my mailing list and this is the power of having one. Blogging is great and something that everybody should do, but you aren’t guaranteed to have your posts reach your audience the way you want. 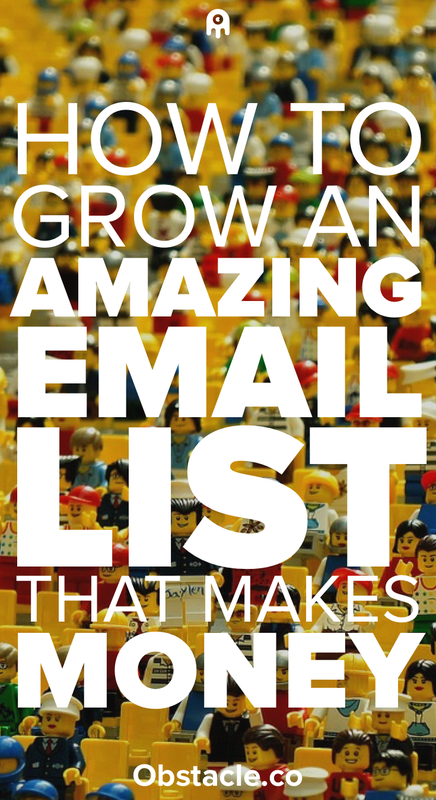 With an email list, you know that your email is going to reach every single inbox. It’s pretty awesome. When building sites in the past my biggest regret was definitely not putting some focus on building the email list. I treated it as something that I just needed to put up and would ignore for months. Every once in a while, I would send an email out and people on the list would wonder why they are receiving the email. The cool thing now is social media. People are trying to get large followings on their social media accounts, but is that better than an email list? I don’t think so, but you shouldn’t ignore your social media accounts either because they are part of the strategy for building your tribe. The fact of the matter is that everyone’s social media accounts are overloaded. When you go on Instagram do you quickly flick through the photos or do you meticulously take your time making sure to study the photos and read every caption? When I go on vacation I don’t even bother checking my social media feeds. When I get back home I quickly scroll to the top of my Twitter account because there is no point in trying to catch up. On Facebook, it is even worse for you because you honestly have no idea if your post is reaching your audience. Instagram is following the same trend and don’t be surprised if Twitter eventually goes that route. Email is the cockroach of the technology world. It will never die. More importantly, you own your mailing list. Twitter is not owned by you. Facebook is not owned by you. YouTube is not owned by you. All you are doing with your social media accounts is renting an audience. The social media companies own the audience. Plus they come and go. The hot social network this week is a dead one the following week. You do control your blog. So isn’t that the best way to keep in contact with your audience? Not really because as great as your blog is, the odds of people knowing they need to check it daily or weekly is pretty slim. You need a way to announce to them that you’ve written some awesome new content for them devour. No doubt you are doing a great job posting things regularly to your social media accounts, but again, we aren’t sure people are actually seeing them. With an email list, you can shoot out an email every single time you write something new. Email is great because people consciously gave you their email address. That means you now have the ability to do a special type of marketing called permission marketing. Seth Godin coined this term and it means exactly what it says. By giving you their email address, your audience has given you permission to market to them. However, as we will see in a bit, you shouldn’t just use your mailing list to spam all of the good stuff you are selling. They want just as much value from your emails as they do from your blog posts. Alright, this is the stuff you’ve been waiting to read. You want to know how to grow you email list. It’s actually a lot easier than you think, you simply have to offer them something valuable in exchange for their email. No, I don’t mean your high school prom dress or your iPhone. What I mean is that you need to promise them value in exchange for their email address. This value is usually in the form of upgrade content. The upgrade content acts as a lead magnet. This is something that you give away for free. On Obstacle.co, at the end of every post, you will see an email magnet. Usually, it comes in the form of an ebook that I will give you for free in exchange for your email address. Beginning bloggers make the mistake of just asking people to sign up for the mailing list to receive updates. That is okay because people do want to receive updates assuming your content is high-quality. However, you will find that you have a better conversion rate (percentage of your visitors that do give you their email) if you exchange it for something right away. Simply telling them that if they give you their email now in exchange for some random updates later doesn’t necessarily entice people. However, if you tell them that you will give them something now in exchange for their email, you will find way more people like that offer. Although your audience is super nice, they are still humans so they will always ask the question: What’s in it for me? And how can you blame them? You can’t just offer them any lead magnet, though. It has to be relevant to your site. If I offered up a lead magnet that taught people the rules of soccer that wouldn’t work out very well on this site. Something that would perform better would be 10 Ways to Get More Traffic to Your Site. What works even better though is if you can tie your blog post into your lead magnet. So in this post, I am talking about how you can grow your email list so I am going to offer you a free video on how to best design your site to capture leads. It’s okay if you don’t have different lead magnets for your post, but over time, you will definitely want to offer more than one. You want to provide so much value that even that stubborn reader who refuses to give you their email caves in because they really want that worksheet on saving money at flea markets. What Do I Put in My Emails? When I finally started to collect emails for Makers Cabin I was super excited because I had a direct line to my audience. However, the only time I would send out emails was when I had something to sell. People understand that from time to time they will get an email about something you are offering, but that is not why they signed up for your email list (unless you’re an e-commerce site). What you need to do is constantly provide them with awesome content so they stay engaged and when it does come time to sell them on something, they are primed and ready. So what type of content can you put in your emails? This is probably the most common because it is the easiest (aka the laziest). What happens is that people will use a plugin to automatically email their list their most recent blog post. So instead of having to go to the site, their email list receives the blog content. This is great because then you never have to worry about coming up with awesome content for your email list. You have a set it and forget it option that ensures your email list stays engaged with you as long as you continue posting to your site. Not all content is meant for emails. Could you imagine receiving this post in your inbox? It’s way too long! Sure I could send you an email with just the excerpt, but are you really getting anything out of that? All I’m doing then is using my email list for announcements. It can grow stale quickly. When I was little my mom asked me the same question every day when I got home from school: How was your day? Because it became so routine I would hit her with the same answer: It was okay. The reason why was because the question had become routine. If you are just sending your email list announcement posts then they will know they can read them later because all you are doing is informing them of another post. If you really don’t have time to produce original content for your email list then I guess the blog posts option is better than nothing. This is my favorite type of content for email lists. Why not offer exclusive content just to your email list? Everybody likes exclusive content and it gives them a reason to stay engaged with your email list. Amy Lynn Andrews writes something called the Useletter that contains exclusive content that she doesn’t post on her site. In fact, her email list is now the default method of communication for her. She writes more content for her Useletter than she does her own site! If you want to go this route you don’t have to write a ton of stuff. Maybe you are just want to share handy tips and cool links you came across this week. You could also do a weekly Q&A. Your audience loves to know you are listening to their questions and responding with answers. The downside to this is that it requires more work than automatically sending out blog posts. If you really want to make this thing successful though then you know you will need to put the work in. If you want, you can treat it just like your blog by queuing up emails for the future. There is no reason for you to wait the week of to write the email. Instead, you can write up a couple of emails and if you need to add some content that is topical just go in and fill it out when the time comes. Some people send out both blog posts and stand-alone content. For me, this seems a bit overkill but is totally dependent on your posting schedule. If you post multiple times a week that might be too many emails for someone, but if you only post once or twice a month, your audience might enjoy getting the random blog post email mixed in with the rest. Every audience differs so don’t hesitate to try things out and pay attention to the feedback. You are now convinced on the merits of building an email list, but you need some tools to help you do it. The first thing you need to consider is which ESP to use. ESP isn’t some fancy brain power, it stands for Email Service Provider and there are a number of good ones out there. ESPs specialize in sending emails out to large audiences. You do not want to collect emails in a spreadsheet and then send them out through Gmail. Sign up for an ESP and use their awesome services. This is a tough question to answer because there are so many out there, but if I had to choose it would be between MailChimp and ConvertKit. How I would make my final choice would depend on how I plan on using my mailing list. If I was just planning on sending out a weekly email to my audience, similar to a newsletter, then I would go with MailChimp because they make this very easy to do. You can do this with ConvertKit as well, but ConvertKit is a bit overkill for something so simple. However, if I want to have multiple lead magnets and email sequences then I would go with ConvertKit. ConvertKit was made for this kind of stuff. One of the hesitations I always hear from people with regards to ESPs is that they are expensive. I know expensive is a relative term and it means something different to everybody, but when you see the value they provide you will understand that they are a small expense that is extremely worthwhile. If I end up paying $79 a month for an ESP and my mailing list generates $13,000 a month in revenue then isn’t it worth it? If you’re just starting off and you aren’t sure how you want to tackle your email list then I would suggest you sign up for MailChimp and use their free tier. This allows you to collect up to 2,000 email addresses and send them emails. When it’s time to finally pay you can stick with MailChimp or you can export your email list to a different ESP of your choosing. That is the great thing about email lists: you have control over them. If you want to collect emails then you need to have forms on your site to do so. These are referred to as capture forms and can be as simple as a form in the footer of your site or something more complicated like a popup that appears after a certain amount of time. How you use capture forms is a pretty controversial topic because you will see a lot of sites use techniques that don’t sit well with me. For example, if I click on a link to an article, I expect to be able to read that article right away. Instead, more and more sites are using a giant placemat to capture emails. This placemat takes precedence over the content that I am trying to read. You will also see sites that use popups that appear out of nowhere distracting you from the content. I don’t use any of these techniques because I want my audience to read the content that I am providing without interruption. This also means I might be sacrificing my conversion rate in the process, but that is something I’m willing to live with. If you do want to see how different types of capture forms perform on your site there are a number of different tools that you can use. Some of them are free plugins, while others are paid services. One of the more popular ones that I’ve seen being used is OptinMonster. I don’t have any experience with this service myself so I can’t say if you should use it or not. I just know it is a popular one. Landing pages are pages specifically designed to capture emails. Usually, nothing else is on the page but the copy needed to get someone to enter their email. An example of a landing page can be seen with Cultivate Your Tribe. This page is solely dedicated to the free, 5-day Cultivate Your Tribe email course. One of the benefits of landing pages is that they give you a page that you can directly link to from anywhere. Going back to the Cultivate Your Tribe email course, I have a number of different forms around the site that help people sign up for it, but what happens if I want to get people to sign up from Twitter? I need a page to link them to. I can’t send them to a post in the hopes that they scroll to the bottom and fill out the form. An awesome opt-in deserves an awesome landing page. Of course, not everybody has the skills to create their own landing pages, but no worries because there are a ton of different tools out there to help you out. ConvertKit allows you to create landing pages within your account and LeadPages seems to be the big dog when it comes to building landing pages. If you are just testing things out and are using WordPress, you can create a basic Page and use that as your landing page. A blog. You can build one without a blog, but the idea is that your blog acts as command central for everything else. An ESP. You need a service that will allow you to store the emails you are collecting. A lead magnet. You need something to entice people to give you their email address. A physical address. Some people are surprised that they can’t send emails out without inputting a physical address. This is part of the Can-Spam Act. You should feel privileged when someone has decided to hand over their email address to you. They are trusting that you will do the right thing with it so you don’t want to break that trust. If they find that you are not offering up any value they will quickly unsubscribe. I unsubscribe from a number of mailing lists weekly due to them not providing me with any value. You don’t get what you don’t ask for so I’m asking you to take a second to share How to Build an Amazing Email List That Makes Money with your audience. They respect great content.